For 2013, the Dodge Durango SUV continues to offer a superior combination of power, fuel economy, style and pricing. The Durango's V6 is one of the most powerful in its class, but the 7-passenger Durango outshines most of its competition by offering a V8 engine that can tow up to 7,400 pounds. You can safely and easily make any seat adjustments while driving. My 2013 Dodge Durango is a very reliable vehicle. It is very comfortable and seats 7-8 persons comfortably. It is gas efficient during non-city commutes. It drives very smoothly and I consider it a very safe vehicle. I enjoy the benefits of having a third row seat but love it when I can lay the seats down to make more room for shopping. I enjoy the personalized individual heating/cooling settings for driver and front passenger, as well as the individual settings for rear passengers. It allows me to keep my groceries cooler in the cargo and third row seat while not freezing me on the drive home. The automotive adjustable seats make driving and riding very comfortable. One problem I have experienced is that it drives so smoothly and easy you can speed and not realize it ??. But overall this is one of the best vehicles I have purchased. It is very dependable, only needs regular car maintenance. I have had three recalls and everyone was fixed promptly. No problems otherwise, I have driven cross country three times with no problems. It is comfortable, has all the features I want like Sirius radio, cruise control, system that tells me when I have a low tire or turn signal light out. Love the third row seating and the way the seats fold up so it is easy to get into the third row. The duel temperature feature is a god send as I am always hot and others are always cold. 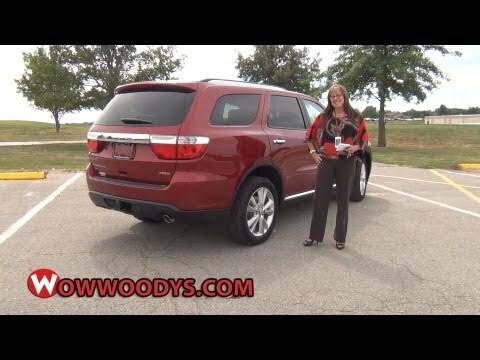 Dodge Durango, smooth ride and many features. Very comfortable ride, drives smooth. We have not had any problems with it and it is 5 years old. Love the controls on the steering wheel and the heated seats. The seats in the back also are heated. There is a 3rd row which is great for having extra room on vacations or just having kids to drag around. We have a maroon color and it is easy to keep clean. The inside is leather seats. Chrysler is recalling certain model year 2013 Dodge Durango vehicles manufactured from April 11, 2012, through July 20, 2012. Some vehicles may have been built with the incorrect airbag occupant restraint control (ORC) module. In the event of a side impact, rearward of the second row seat, the supplemental side air bag inflatable curtain may not deploy as intended, increasing the risk of occupant injury. Chrysler will notify owners, and dealers will replace the ORC module, free of charge. The safety recall is expected to begin during September 2012. Owners may contact Chrysler at 1-800-853-1403. Chrysler (FCA US LLC) is recalling certain model year 2012-2013 Jeep Grand Cherokee vehicles manufactured September 17, 2010, to August 19, 2013, and equipped with a 3.6, 5.7 or 6.4 liter engine, and 2012-2013 Dodge Durango vehicles manufactured January 18, 2011, to August 19, 2013, and equipped with a 3.6 or 5.7 liter engine. In the affected vehicles, the fuel pump relay inside the Totally Integrated Power Module (TIPM-7) may fail, causing the vehicle to stall without warning. Chrysler will notify owners, and dealers will replace the fuel pump relay with one external to the TIPM. The recall is expected to begin April 24, 2015. Owners may contact Chrysler customer service at 1-800-853-1403. Chrysler's number for this recall is R09. Note: This recall is an expansion of recall 14V-530. Chrysler will notify owners, and dealers will add a water diverter shield to the booster after the booster has been tested to confirm it can hold an acceptable amount of vacuum pressure. If the booster inspection confirms an unacceptable loss of vacuum pressure, the booster will be replaced. Repairs will be made free of charge. The recall is expected to begin in May 2014. Owners may contact Chrysler at 1-800-853-1403. Chrysler's recall campaign number is P14. Chrysler Group LLC (Chrysler) is recalling certain model year 2011-2014 Dodge Durango and Jeep Grand Cherokee vehicles manufactured January 5, 2010, through December 11, 2013. In the affected vehicles, the wiring for the vanity lamp in the sun visor may short circuit, after a service repair is performed. If the vanity lamp wiring shorts, there is an increased risk of fire. Chrysler will notify owners, and dealers will inspect and repair any damaged wiring, and install a new sun visor that properly routes the wire, free of charge. The recall is expected to begin in August 2014. Owners may contact Chrysler customer service at 1-800-853-1403. Chrysler's number for this recall is P36. Chrysler is recalling certain model year 2013 Durango vehicles manufactured April 27, 2012, through September 14, 2012. The vehicles may have been built with incorrect seating capacity information labels. The label might overstate the seating capacity. Therefore, these vehicles fail to comply with the requirements of FMVSS number 110 "Tire Selection and Rims." Chrysler will notify owners, and provide replacement labels free of charge. At the owner's option, they may take their vehicle to a Chrysler dealer for installation of the label. The service will be performed free of charge. The recall began on February 18, 2013. Owners may contact Chrysler at 1-800-247-9753. Chrysler Group LLC (Chrysler) is recalling certain model year 2012-2013 Dodge Durango and Jeep Grand Cherokee vehicles manufactured October 11, 2011, through October 1, 2012. Under certain braking events, the Ready Alert Braking System (RAB) may result in the driver experiencing a hard brake pedal feel. Chrysler will notify owners, and dealers will update the ABS module software, free of charge. The recall is expected to begin in March 2014. Owners may contact Chrysler at 1-800-853-1403. Chrysler's number associated with this recall is P05. If the brake booster shield was not installed properly, the vehicle's braking ability may be reduced, increasing the risk of a crash.